Since June 2014, many people have escaped to Kirkuk province due to the conflict with the radical group “Islamic State (IS)”. The prices of commodities, such as rent and transportation expenses, increased due to the influx of IDPs. On the other hand, wages for manual labor declined. For some in the host community, the itnflux of refugees has led to feelings of animosity, with tensions flaring up between IDPs and members of the Kirkuk city. The northern major city Mosul was recaptured from the IS, but even without the presence of IS in Iraq, there continues to be concern that tensions between Sunnis (including IS) and the Shiites will intensify in the future. A psychiatrist checks the necessity of mental treatment through a workshop. We cooperated with the local NGO “INSAN” during the summer vacation and we held a 3-week workshop for children from both the IDP and host communities to alleviate ongoing tensions between these groups. 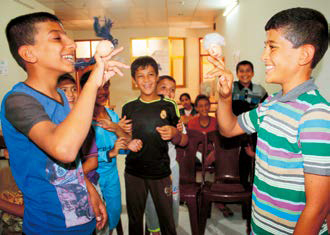 The workshop consisted of using art and theatre to learn about “peace and coexistence”. During the workshops, a group of boys who were not friendly at the beginning became friends, exchanging their mother’s mobile numbers at the end. Psychology experts and social workers also cared for children who had suffered mentally due to the conflict. In December 2016, we invited Mr. Aree and Miss. Lammia of INSAN to Japan. As an organization that has been conducting activities that embody the principle of “peace without force,”, we held debriefing meetings regarding our specific activities in Iraq. These debriefing meetings emphasized the need for activities that encourage the coexistence between IDPs and the host community. In the future, there is concern that conflicts among sects will increase in Iraq. We will continue to conduct peace education workshops that teach the principles of “peace and coexistence”, so that the children of IDPs, the children of the host community and the children of different sects can interact with one another peacefully. In addition, as the unsafe situation in Iraq is prolonged, we will continue to provide mental care by experts to support children who have suffered mentally as a result of the conflict. Through our activities to children, we will broaden its influence to include parents and prominent people in the community. We aim to strengthen community solidarity through promoting dialogue among people and implementing peace-building efforts at a grassroots level. Learning cohabitation by a method of theatre. 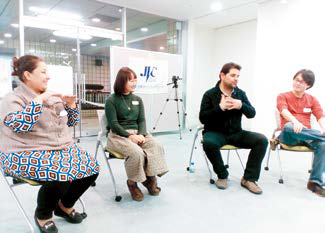 A workshop on “non-violence training” conducted in Niigata prefecture by Mr. Aree and Ms. Lammia of INSAN.